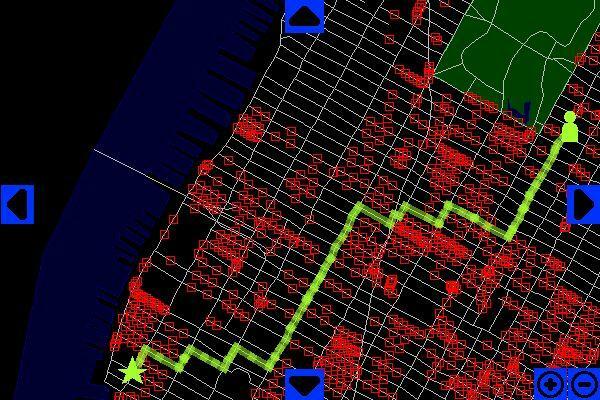 Map-generation software that provides users with their “of least surveillance” between two locations in New York City, iSee Manhattan uses data collected by groups such as the New York Civil Liberties Union and the Surveillance Camera Players. The interface was first launched online in October 2001, and a handheld-compatible version was released the following year. Like most mapping software, users enter their origin and destination; iSee then calculates a route covered by a minimum of surveillance cameras. Additional iSee platforms have also been developed for Amsterdam, Ljubljana, and Boston. iSee was developed by The Institute for Applied Autonomy. Founded in 1998, the institute is dedicated to the cause of individual and collective self-determination, and provides activists with tools for extending their autonomy.